Meet Lin Yi — a little boy with a big heart and a talent for bargaining. He wants to buy himself a red rabbit lantern at the market for the moon festival tonight; but first, he must buy the things his mother needs. Will he be able to save enough money on his mother’s needs to buy the lantern? This heartwarming story shows the rewards of putting others first. 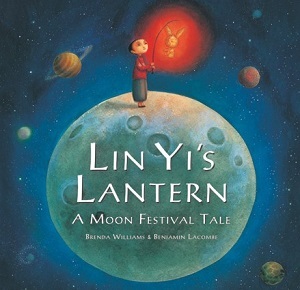 Features educational notes at the end about the Chinese moon festival, life in rural China and the legend of the moon fairy.